Richard Hayman, who died early in 2014 aged 93, was an American harmonica player, arranger and conductor, who was renowned both for his contribution to popular light music over several decades and for the flamboyant sequinned jackets which became an essential feature of his on-stage persona. He particular musical niche was in finding a role for his favoured instrument, the harmonica, in the orchestrations which he did for his orchestras, especially in the first two decades of his career, the ‘50s and ‘60s which is the era covered by this collection. In the last 50 years of his life he was closely associated with The Boston Pops Orchestra and The St. Louis Symphony Orchestras pops concerts. Just over half the tracks on this great value 53-track 2-CD set feature the harmonica as part of arrangements he did for his orchestra, recording throughout the period for Mercury, and including his big 1952 movie theme hit “Ruby”. We also include other lush orchestral recordings he made as part of his prolific LP output showcasing the new stereo medium during the late ‘50s. Of special added interest are recordings he made with his orchestra accompanying Julian Cannonball Adderley on his “Adderley With Strings” LP in 1955, and tracks from the same period accompanying the great Sarah Vaughan. It is an entertaining and enjoyable retrospective of the early career of an underrated artist. 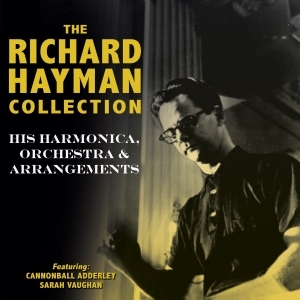 5 The Story Of Three Loves (Rhapsody On A Theme Of Paganini) Jerry Murad & The Harmonicats with Richard Hayman's Orch.